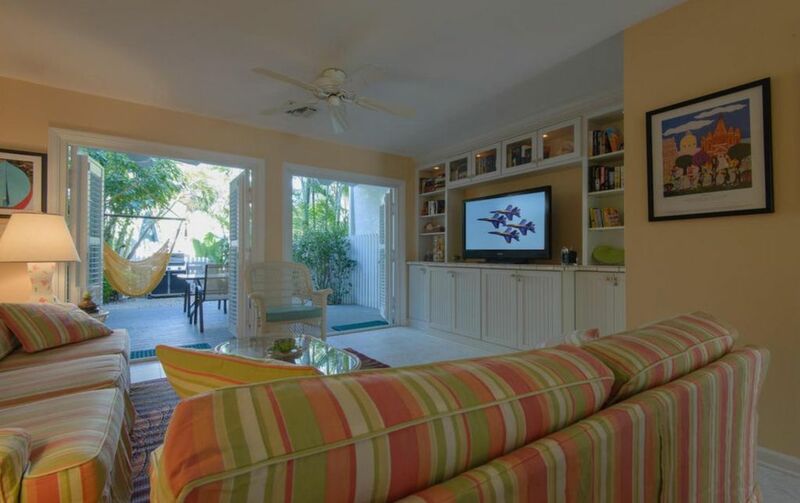 Your peaceful oasis in the perfect Key West location. Two bedroom, 2.5 bath townhome in Truman Annex two blocks to Duval Street. Quiet, clean, comfortable oasis in perfect location for enjoying Key West without the need for a car (although it comes with a private parking space). Pool out the back gate. Upper deck, lower patio, brand new full kitchen - all the amenities of home. King bedroom with private deck and bath, queen bedroom with private bath, pull out sofa in living room. Normal checkin - checkout day is Saturday. Reasonable rates and awesome, but modest, owners. Living Room and Each Bedroom. Two blocks from the action on Duval Street. Wonderful condo. Has everything you need to enjoy your stay including comfortable beds. Location was perfect with access to the pool and patio. Nice and relaxing. Close to Duval but quite. Loved the condo...clean and cheerful! The location could not be better. Comfy beds and well stocked kitchen. This was our third visit to the Keys and Flip Flops was by far the best rental. We loved our week at your beautiful home. We loved the location, so nice and close to the pool. Also very convenient for getting around town. The patio and upper deck were great. We did wish however that you had 4 chairs on the upper deck. With 2 couples sharing the home it would be nice to all sit out there together. Other than that, everything is perfect. We already booked for next year! Fantastic stay, couldn't ask for anything better! We had a lovely time at Flip Flop Retreat. It has been kept up beautifully. Kitchen modern. Living area cozy and charming. Outdoor space very pleasant.